- 1 GB ext4 partition for boot manager, if needed. - 125 GB ext4 partition for Arch Linux 32 bit system, with installed programs, etc. 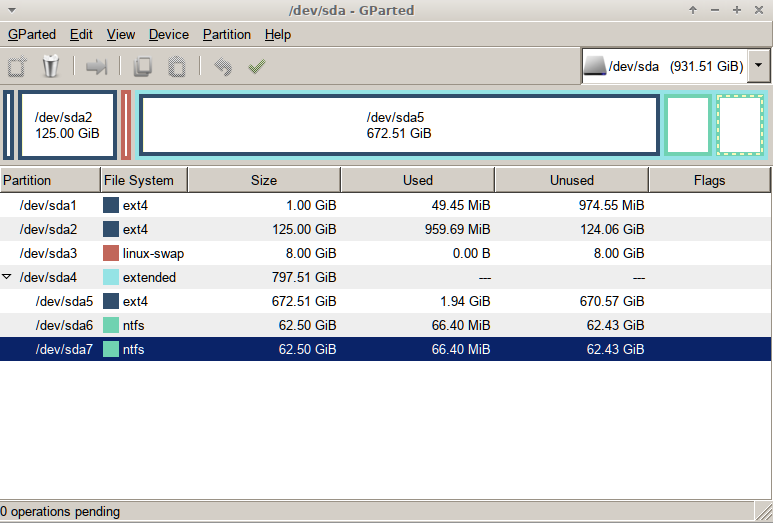 - 8 GB partition for Linux swap. - - 672 GB ext4 partition for general / media storage. - - 62 GB ntfs partition for possible installing a Windows system in the future with dual boot, in case of need / emergency / etc, or experimenting with other Linux distros. - - another 62 GB partition for trying out different file systems (btrfs, etc). Currently I have attached my both hard drive to the computer by SATA cable, and I am running my Arch Linux 32 bit system from the other 500 GB Western Digital drive. My another question: is it possible to make a "clean" installation of Arch Linux 32 bit onto the 1 TB new drive while I am running the Linux system from the other 500 GB drive? Yes, it's posslble to do that. Just follow the instructions for installing from a boot DVD, and where it says to boot from the DVD just boot from your old hard disk. Partition the new hard disc as instructed and mount it, and then start populating it using the supplied scripts. The only exception I'm aware of is installed arch installations generally don't have a copy of pacstrap lying around, so you'll need to grab that before you need it. In terms of partitions, there are many ways to do it. Personally, when I have a large contiguous drive to install to, I split on /var, /home and /boot. My home partition periodically fills completely up, and it helps not to break logging and other stuff when that happens. Similarly, /var/cache/pacman tends to fill over time, so setting hard limits for that as well doesn't hurt. Having /home partitioned separately has also made OS rebuilds simpler on occasion, although that's less and less common these days, but if it turns out you've partitioned wrongly it can be a life saver. The theory behind splitting /boot off it that it's supposedly possible to resurrect a system just having a bootable initcpio and kernel, although I've never actually done that, and suspect it'd be harder than just rebuilding the OS from a live DVD. 8 GB partition for Linux swap? On a 32-bit system? Maybe if you use PAE..
you plan to install, and a /home directory; this can make upgrading or disaster recovery easier). Is that the right link? I don't see any recommendations for partition sizes there myself. Presumably you're following an install guide (such as that one) for your other questions though. Ah, that link is more on how do you install Archlinux from an already existing Linux distribution on the system. I find a separate /home useful. Windows installation and you want to keep the boot area safe(r). Old machines should use a BIOS partitioning scheme, GPT is for EFI. more than 4 GB swap make rarely sense on 32-bit machines. Regarding swap, as a linux only user, I've never found a reason to create a partition and only ever use a swap *file* if doing a big compile. I didn't realise you needed swap to hibernate to disk (although did idly wonder where it was trying to dump ram to in that case), so maybe I'll try enabling my swap file before hibernating too. As a file, you can make it any size you deem sensible, and change it afterwards if it turns out to be too big or too small. 128MB of RAM used to be plenty to bring my old Pentium 3 running arch up from cold, and I doubt that's changed, so you don't need extra ram to boot normally. Installation with "pacstrap" and "arch-chroot" was successful! Unfortunately hibernation doesn't work, need to be resolved yet. New system with 4.20 kernel and Nouveau video driver is more responsive than my previous installation with 4.10 kernel and nvidia-96xx-dkms video driver. However the hard disk became a faster one, programs load in reasonably shorter time now. GUI system was xfce4 in both cases. A new hard disk often accelerates the system a lot - especially if you happen to changed from a hard disk to an ssd. FWIW, I've just upgraded my server box (running arch64, but I'm sure the space would be plenty for arch32 bins too) using a TOSHIBA DT01ACA100 (snap) that I had been using for backups, but since then I bought a 3TB drive when the price per gb for that size became the lowest. I just copied over my the contents of my old partitions to the new drive, reinstalled grub, fiddled with the fstab and hostname files (gave it a different hostname, just for fun). There's some helpful tips on that Installing arch from another linux article that I'd missed, primarily using the -x option to cp to stop it copying over recursive mountpoints, which would have simplified things for me and maybe stopped me accidentally copying my /boot folder contents to /boot/boot, which cause a fair bit of headscratching*, but I've finally fixed that after a few days of failing to spot my mistake. My partitions were 16GB for root, 8GB for /var 64MB for /boot and the rest for /home on my older 320GB drive. For this update I've doubled boot to 128MB because it was looking a little tight, and updated my /var to 16GB (I've not deleted my pacman cache since early 2016 apparently, and in my experience your /var/cache/pacman/pkg folder is the vast majority of any /var folder). Just put the final bolt in and secured the tin box that is my server (actually an old desktop chassis, meaning I had to take out half of the cabling on the motherboard before I could manoeuvrer the old hard disc out). It's emitting a bit of a hum at the moment (unsurprising when it's spinning at 7200rpm, I guess) so I'll have to see if I can live with that. * When you've not got a kernel in the right place in /boot, there's no symptom when you chroot onto it because it's still running the parent kernel, all that really happens is grub-mkconfig just prints out a config file with no menu items in it. I copied my old grub.cfg over and tweaked the uuid and got it to boot so far, but when it told be it couldn't find the kernel, it took me a surprisingly long time to actually check it out.